2015 was a great paddling season, for myself, in Southwestern Nova Scotia. I discovered the Tobeatic about 4 years ago and ever since I have been wanting to explore as much as possible. I was able to visit some new areas this past year and had the opportunity to make multiple trips. I started a new interest in sea kayaking last year and was able to achieve Paddle Canada Level 1 (a two day course), then Paddle Canada Level 2 (a six day course), all taken within the local area. I also attended the three day Bay Of Fundy Sea Kayaking Symposium based in Argyle, which was an amazing event. I had the very good fortune of meeting and paddling with some great people along the way and learned a lot during 2015. I had the privilege of showing new paddlers some of the lakes and rivers within SW Nova Scotia, which has been a great experience being able to pass along local knowledge to people with paddling interests. 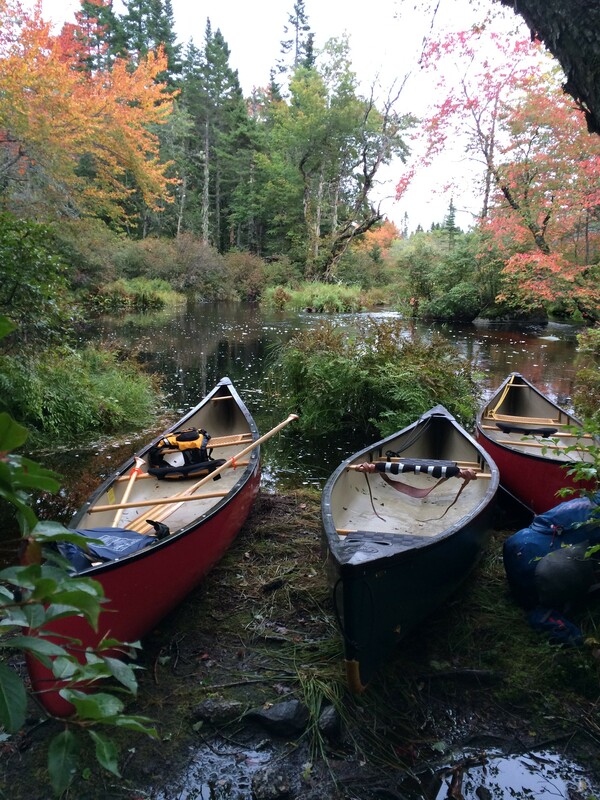 -Canoeing and kayaking the East Branch River in Kemptville and other parts of the Tusket River. -Canoeing the Roseway River at Indian Fields. – Kayaking the Lower Roseway River in Shelburne County. – Tobeatic, Canoeing West Roseway Lake then hiking to Hannah Lake via the Old Grayhide Trail. 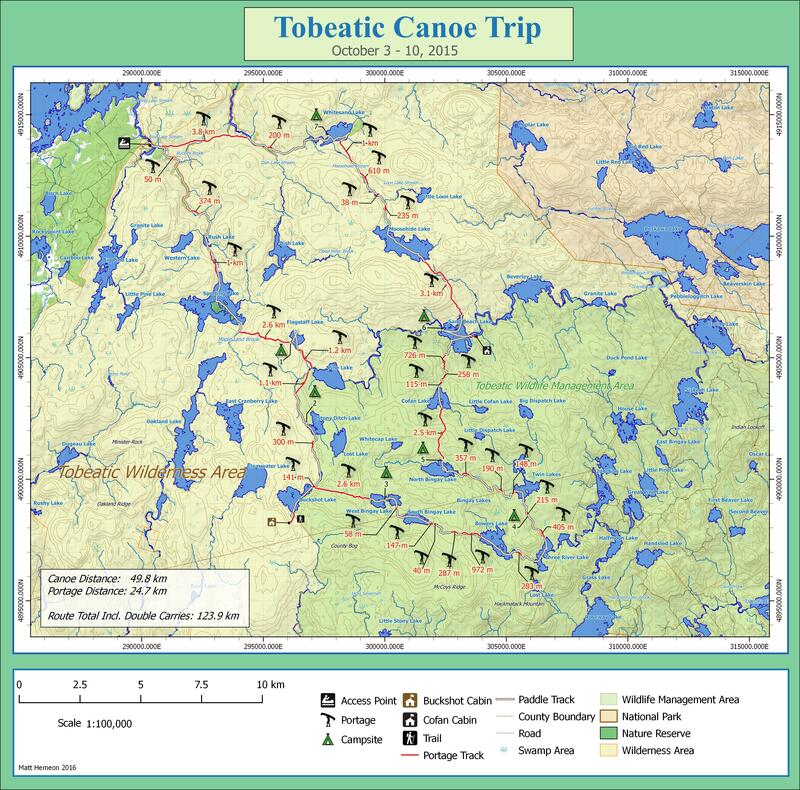 -Tobeatic, Canoeing Sporting Lake Stream to Whitesands Lake, over to Dish Lake then back to Sporting Lake making a loop. 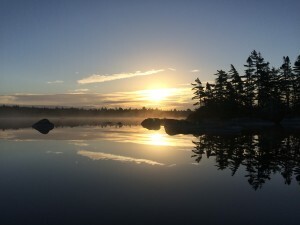 – 5 day Keji backcountry trip – Big Dam Loop to West River, then onto Peskowesk Lake ending at Peskawa Lake. The last Tobeatic trip of the season was one we had been planning for about a year, and it included three Southwest Paddler Association members. I would like to share some of our experience. 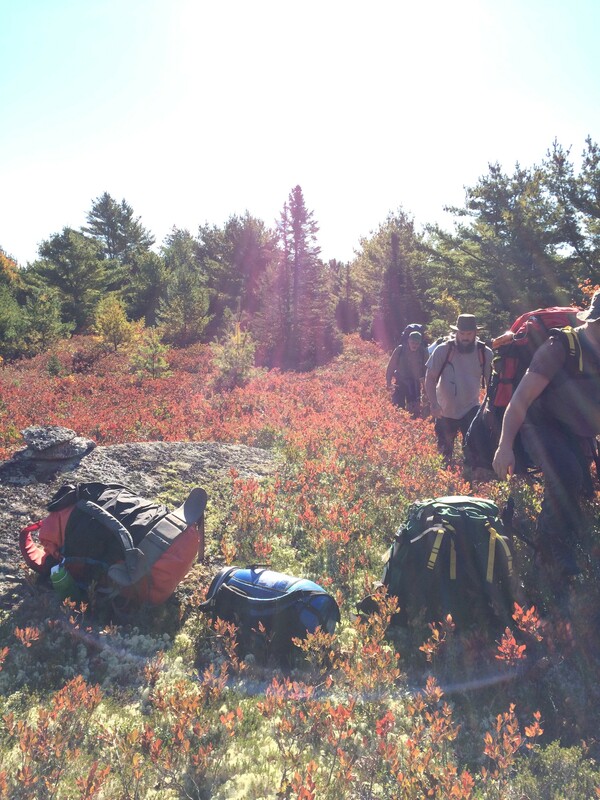 Oct 3 – After a few short delays along the way we all met at Sporting Lake Stream around 0700. The weather was cloudy and chilly that morning but we were excited to begin our trip. The portages to Sporting Lake were well traveled, the trails and campsites were all well used but this, sadly, also meant seeing some unsightly garbage along the way. Once on Sporting Lake we made a stop on the largest of three old-growth forest islands belonging to the Sporting Lake Nature Reserve, as it is always a must when paddling by to stop and explore. Walking around these islands is never a let down. The portage from Sporting Lake onto Flagstaff for the most part was ok to follow but ended up taking the better part of the day to complete as it did need scouting to find the trail and a little maintenance to get through, plus it was over a 2km carry. We seen some fresh moose and bear signs. The Campsite was at the end of the portage overlooking the lake, hiding behind the trees. Water was still about 50m from the campsite. Oct 4 – Woke up to a chilly but sunny morning. I had heard a story of old rum bottles being found on the north side of the lake so we decided to venture up and see if we could find these or any evidence of an old camp, unfortunately we found nothing but we did see more moose tracks. Paddled down to the south side of the lake and found parts of a blazed trail that followed the brook down to Pine Lake but ¾ of the way down we lost the trail when the forest turned into barren land, from there we crossed over a ridge and were easily able to find our way to the Shelburne River. We hit Pine Lake on the west side just as it turns into a river and the next portage was only a couple hundred meters from this put in point. The portage to Stoney Ditch Lake, to our surprise, hadn’t been traveled very much and was grown in and hard to follow in spots, it seemed much worse than it had two years ago when we last walked it. Made it to the campsite by Stoney Ditch Lake about two hours before sunset and we discussed if we should stay put for the night or push on to Buckshot Lake, hoping to make it there before dark. Knowing this decision may cost us the following day we decided to stay put as everyone was getting tired and hungry at this point, and the campsite was such a nice and inviting spot, so the decision was made to get up early and hit Buckshot in the morning. After dark when everyone had eaten supper and were warmed up by the fire, we decided to take a short paddle on Stoney Ditch Lake to view the stars and it didn’t disappoint! It was an amazing view of the night sky with calm waters and the mist rising from the lake around the erratics made it even better. Oct 5 – The plan today, Buckshot Lake, Buckshot Cabin, West Bingay Lake – sounded simple enough. We paddled across Stoney Ditch Lake then onto the stillwater and completed the two 200+m carries into Buckshot Lake. We had tried to find Buckshot Cabin on a previous trip two years ago but with no success. This time, however, we had the GPS coordinates. We were still unable to find a trail from the lake to the cabin, as things have grown up a lot in recent years, but we did find a trail about 100m before the cabin, but even that was hard to follow. Buckshot Cabin had, sadly, collapsed with only one wall remaining standing. It appeared that this may have happened recently, possibly over the previous winter. Regretfully, it would have been nice to have seen when it was still standing two years ago. We were able to pick up blazes and a faint trail from the cabin to West Roseway Brook but that will be an adventure for another time. We stayed about an hour looking in and around the cabin then returned back to the lake to start the portage to West Bingay Lake. It was roughly noon when we got to the carry and decided to stop for a quick lunch before starting out. Thanks to Jim Todd, Matt had all of the GPS coordinates for the portages to follow and so we were on our way. The first 100m of the trail was really nice and easy to follow but this did not last, pretty quickly it became necessary to have Matt in the lead with the GPS flagging the trail while we followed behind carrying the packs and clearing a way for us to follow when we had to return for the boats. We got to about the halfway point when a barren started, we returned for the boats, cleaning and marking the trail a bit better on the way back. Once on the barren things became much more difficult with harder walking through hardhack and problems finding the trail. We made it to West Bingay Lake just before dark but we still had the return trip for the canoes, which were still about 1000m back on the barren. Initially we thought we would just make camp close to the lake as the campsite was halfway down the lake on a point of land, but I then realized that my food barrel was back with the canoe so Jeremy and myself decided we would go back for it even though it was going to be dark soon and all were exhausted and hungry at this point. Everyone accepted the challenge and agreed to go back together knowing it was probably a bad idea and we would be carrying in the dark. Equipped with headlamps, compass, GPS, and flagging tape we marked the trail extremely well to have something to follow to easily make our way back. We made it to the canoes with just moments of daylight left and then it became dark, really dark. We all took the carry one step at a time slowly as a group, resting about every 100m. We lost the trail a few times and had a few falls but fortunately no one was injured and finally we made it to a very still and dark West Bingay Lake with all our gear. Everyone at this point was exhausted, hungry, dehydrated, cold, and sore so we got in our canoes and started paddling to find the campsite. Once on the lake it all seemed worth it and everyone took pause to take in the wonderful sight of the lake and the dark sky. It was a very dark night but the stars were glowing and with no wind the mist was slowly rising off the lake around our canoes and the numerous erratics littering the lake. The silhouette from the headlamps of the others in their canoes was a memorable sight all the while thinking of just how deep into the Tobeatic we all were at this moment in time. After a bit of searching we found the campsite which seemed to have not been used in quite some time. It was around 2200 hours and there wasn’t much sitting around the fire talking this night. Basically we made camp, ate supper, then all were fast asleep. Oct 6 – Woke up to a beautiful sunrise and felt well rested. Decided to go for a pre-breakfast paddle to fully take it all in and get a better view of the lake. It’s a really nice lake that reminds me of a mini version of Sisketch Lake. No wind, mist slightly off the lake, and a spectacular sunrise that changed slightly every minute. I took numerous pictures of this amazing morning and was happy to be within the more remote lakes of the Tobeatic. Went back to camp for some breakfast and to pack up. We were able to avoid the short carries into South Bingay Lake by pulling the canoes over the rocky sections. We Paddled across South Bingay and into the stillwater enroute to Bowers Lake. The last half of the carry into Bowers Lake it started to become overgrown so we brought all our packs to the lake and only carried the canoes about half way, before the overgrown section, as we figured we could paddle and pull over the rocky sections until getting to the lake. It was ok for the most part but probably didn’t save us any time by doing this. From Bowers Lake we paddled down to Three Rivers Lake which had some large interesting erratics with one very large rock looking like it had the number 11 painted on the side from the natural lichen growing on it. We made it to the campsite at the start of the portage before Twin Lakes, which had a large rock next to the fire ring and a running brook to sleep by. Oct 7 – Woke up to a chilly, sunny morning, packed up and started on the portage to Twin Lakes. Everything seemed well and we started cleaning and marking the portage but when we got to the end we were welcomed by hornets, three of us were stung and all of us were sent running, dropping our packs along the shore line as we ran. When we brought the canoes up and made a detour, we were safely able to retrieve our gear without incident. We then paddled onto Twin Lakes which was also an interesting lake with numerous large erratics and I hope to do more exploring at this lake in the future as we only got to see a portion of it before hitting the portage enroute to North Bingay Lake. The carries in the Bingay system are not well marked and need some work, we do our best to clear as we go to help future paddlers who visit the area. A couple beaver dams in the stillwaters, one being almost three feet high before the last carry into North Bingay. North Bingay Lake was a lot more welcoming to us on this trip than two year’s prior when our introductory trip was met with a rainy, cold and windy lake. This day was sunny with a light breeze. We paddled directly to the old growth island on the lake, which I was looking forward to seeing again. The trees are about the same size as the old growth at Sporting Lake but here something is different, I think it’s the forest floor that makes it more peaceful as it is blanketed with mosses and ferns amongst other shrubs. For myself it has the feel of a spiritual or sacred place. We all divided up to wander the small island taking in all the sights and eventually gathered by a large rock near the center of the island. We sat around talking, reflecting, and had a small smudging ceremony of sage, cedar, sweetgrass and I felt as though there was no better place to do this. Once leaving the island we paddled over to the campsite and decided that since it was only mid-afternoon we’d bring the canoes as far as we could on the portage to Cofan Lake to save us time the next day, we also cleaned and marked the trail better than we had two years prior. We made it roughly half-way through the portage before deciding to return back to the campsite giving us lots of daylight to make camp for the night. Oct 8 – Woke up to a wonderful sunrise, sunny, wind calm. Had breakfast and packed up, just before leaving we heard a pack of coyotes howling to the south. Made good time on the portage and before we knew it we were at the canoes. We took a rest and then continued on with the boats, cleaning and marking the trail as we went. It was interesting to see the old rock on rock portage markers along this trail, which hints of its history and the travellers before us. Made good time to Cofan, paddled across the lake, moderate wind and still sunny. The next three portages in the stillwater leading into Sand Beach Lake slowed us down a bit as it was difficult to find despite travelling this same route, in reverse, some time ago. Eventually we were able to find the trails, which we cleaned and marked better. Once arriving at Sand Beach Lake it was around 1700 or so, we decided to take our time and play tourist on this lake as we had things we wanted to see. First we went to Jim Charles Rock to explore around, this is located right next to the lake. Then we went over to Cofan Cabin as we knew it had been recently restored and wanted to see the progress. Things looked very well and a great job had been done restoring this original Tobeatic Warden’s Cabin from 1928. At the time of our trip there were still plans for another group to return to the cabin to complete the project. We decided to camp on the very nice esker campsite located on the west side of the lake. Oct 9 – Was the coldest morning yet, frost, another amazing sunrise, a calm misty lake. This day our task was attempting to make it to Whitesands Lake. It was a little slow getting started due to the cold but once the sun was out for a bit things quickly warmed up. Paddled over to the 2800m carry into Moosehide Lake, this was the first carry since leaving Sporting Lake that was well marked and easy to follow, however once on Moosehide the sky was starting to cloud over. No problems paddling across this large clear spring fed lake. Once into the stillwater progress slowed a bit as there were four more portages (300m, 50m, 600m, and 1000m) before making it to Whitesands, all were well marked and still easy to follow. We saw our first paddler of trip on Moosehide Stream, a single paddler enroute to Keji. Once on Whitesands Lake the wind had increased and it appeared like we were going to get some rain. We explored the lake a little as it is known for its sandy beaches and paddled by a couple of private camps that are still standing. We had the option of the campsite on the end of the portage or there is a nicer one on the upper west side of the lake. Although this spot is nicer it’s also a little more exposed to the weather and wind, but still we decided to make camp here. Just as we arrived and began to set up camp the rain started, we were able to set up tarps, put on dry cloths, and have our supper. As we climbed into our beds for the night I’m sure everyone reflected on our week long journey and thought about how special this experience was, all the while knowing that this would be our last sleep under the stars. Throughout the night the rain and winds had increased and a couple of us had issues with tarp lines that needed re-securing during the night, however by morning the rain had stopped. Oct 10 – Woke to sun and cloud but the wind had increased. Plan was to paddle 4th/5th Lake around to Sporting Lake Stream but it was decided due to the strong winds it would be better to take the long esker portage which starts on the stillwater just above the Dish Lake carry. It is a beautiful trail on top of an esker that runs the whole way to Sporting Lake Stream and probably the best natural portage I’ve walked yet in the Tobeatic, but (and there always seems to be a “but” when traveling in the Tobeatic) it’s long, very long, at 3800m. We made it back to the vehicles around 1400 feeling very accomplished with what we had done throughout the previous eight days in the Tobeatic. There is always a feeling of sadness when a trip is over but you’re also eager to get back to home and begin planning for the next adventure.